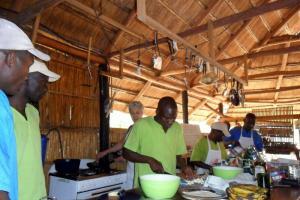 Chef Training on Mumbo Island! August saw a wonderful week of chef training on Mumbo by the talented Juleta Hirner, who has been training the Mumbo chefs on and off since 2004. It’s been a clattering, fragrant roller coaster ride full of unexpected joy and the odd maddening moment. The Mumbo chefs are pretty isolated: no glossy food magazines or recipe websites for inspiration, but the daily task of satisfying a myriad of tastes, from rarefied Swiss culture vultures to ravenous young honeymoon couples. This time around we have revamped the whole menu, line-by-line, cupful-by-cupful. “Douglas, you are murdering that fillet! Mr Ked, I have never seen a more beautiful salad. The talented Mumbo food team are now making Spicy carrot cake with Amarula cream, Tangy pineapple dessert with an apricot glaze, Light and crispy cheese pastry pinwheels with home made tomato chutney, Beef fillet with mustard and pepper sauce, Heavenly little chicken pies and, wait for it… Goat, mushroom and bacon goulash with creamy mash. Book your trip and take your spirit, mind and taste buds to paradise!